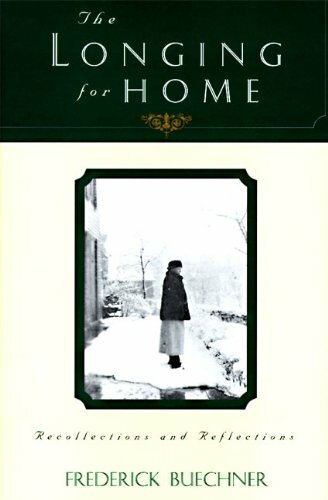 In this deeply moving book of reflection and recollection, Frederick Buechner once again draws us into his deeply textured life and experience to illuminate our own understanding of home as both our place of origin and our ultimate destination. For Frederick Buechner, the meaning of home is twofold: the home we remember and the home we dream. As a word, it not only recalls the place that we grew up in and that had much to do with the people we eventually became, but also points ahead to the home that, in faith, we believe awaits us at life's end. Writing at the approach of his seventieth birthday, he describes, both in prose and in a group of poems, the one particular house that was most precious to him as a child, the books he read there, and the people he loved there. He speaks also of the lifelong search we are all engaged in to make a new home for ourselves and for our families, which is at the same time a search to find something like the wholeness and comfort of home with ourselves. As he turns his attention to our dreams of the heavenly home still to come, he sees it as both hallowing and fulfilling the charity and the peach of our original home. Writing with warmth, wisdom, and compelling eloquence, Frederick Buechner once again enables us to see more deeply into the secret places of our hearts. The Longing for Home will help to bring clarity and guidance to anyone who searches for meaning in a world that all too often seems meaningless. Frederick Buechner, a Presbyterian minister and a prolific author of more than two dozen works of fiction and nonfiction, uses writing as one way to comfort him, especially in times of nostalgia. The Longing for Home is a collection of musings on the loss of home and what he calls a universal homesickness. The book explores the meaning of home and examines ways to find a safe haven. Loved ones and natural beauty are highly valued, but it is mostly one's faith in Jesus that provides the most restful of places, submits Buechner in this beautiful and touching work.